This Frieze season brings together two seminal, if inevitably controversial, artists, the ridicule of whom is currently fashionable (for examples see Abstract Critical on Twitter @abstractcrit): Anselm Kiefer and Richard Serra. 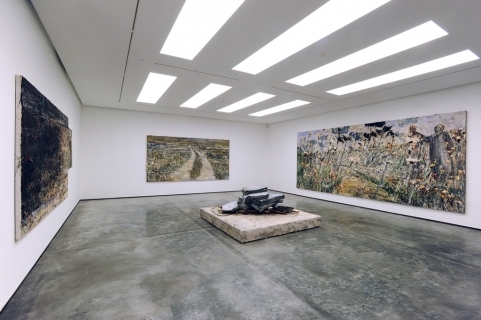 The latter, at Gagosian’s Brittania St and Davies St locations, opened 10 October 2014. I walked into the Brittania space past a phalanx of black limos, and two somewhat aromatic gentlemen sitting outside, discussing where they’d stashed their heroin paraphernalia. 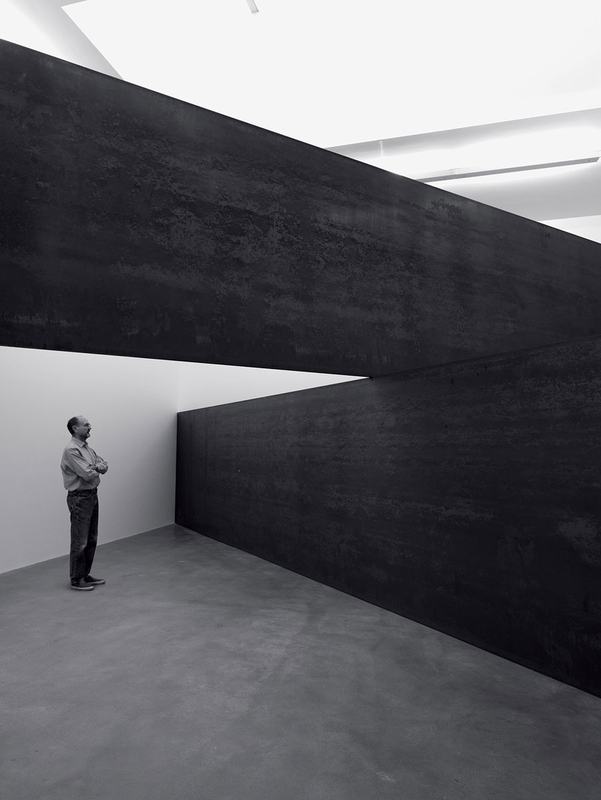 Serra from Gagosian exhibition, 2014. The overall impression, of both shows, was of artists past maturity, if not quite ancient, perhaps seeking to find that last blast of (re-)invention, that would cement their place in the history books. Serra’s show was carried by waves of Chanel No 5 in the gallery’s emphatically ‘neutral’ space. There were quite a few suits, but the semiotics didn’t suggest these guys schlepped into Canary Wharf everyday on the Jubilee Line: this was definitely ‘real money’ (in the parlance of the City), that had flown in for the occasion. Larry Gagosian presided regally over the affair in an emerald pocket square and well-matched tie. This international crowd contrasted with younger, London-centric and uber-trendy set at Herald Street Gallery’s new space in Soho, where we went afterwards. Serra’s works themselves showed sufficient formal innovation, but little that took one’s breath away. There was a ‘propped’ piece, a forged-and-stacked piece, a type of the ‘torqued’ or ‘torus’ work, and a variation on Equal-Parallel: Guernica-Bengasi (at Reina Sofia Museum, Madrid). The works highlight his preoccupations: the phenomenological push-pull experience of the viewer against something of almost-comparable size but alien, yet familiar, form; the nature of curvatures and the industrial processes required to produce curves in large size and weight; the relationship of architecture to art. The prop-piece was notable for the impression, or illusion, it gave that the whole room of the gallery had to be re-built around the piece, since it couldn’t have been brought in through the visible doorways, while the piece itself was tightly wedged in the diagonals of the room. 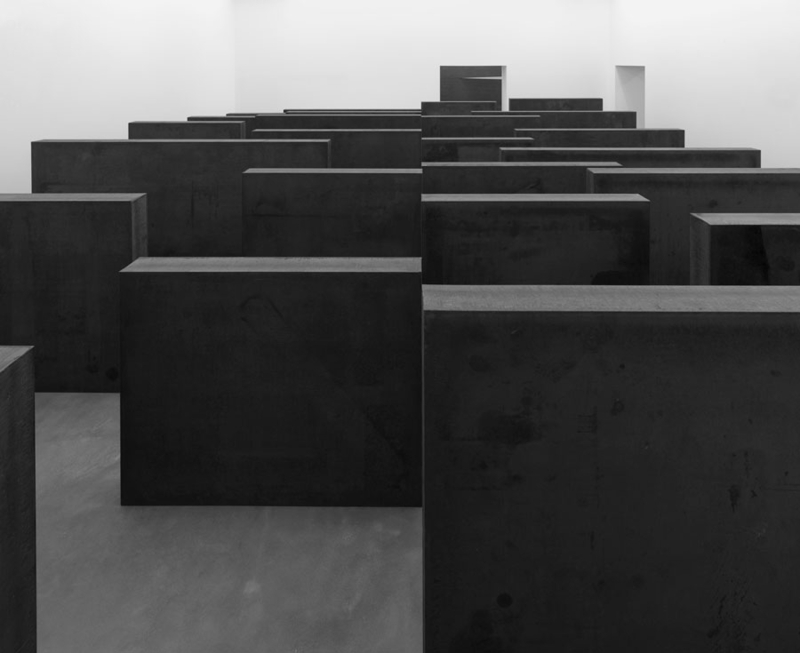 It recalled Serra’s continuing dialogue, occasionally antagonistic, with architects, and also echoed Kiefer’s comment in a Tate interview about how he thinks about housing his over-size sculptures – he simply builds buildings around them. The torus piece, while less formally impressive than the Dia Beacon Torqued Ellipses (c. 2001), continued to explore engineering themes present in the older work. Both sections had at least two axes, possibly three, of curvature combined with a modest inward lean, again with no visible reinforcement, relying on vectors of force and weight to hold both up. The resulting inner cavity formed a tunnel. 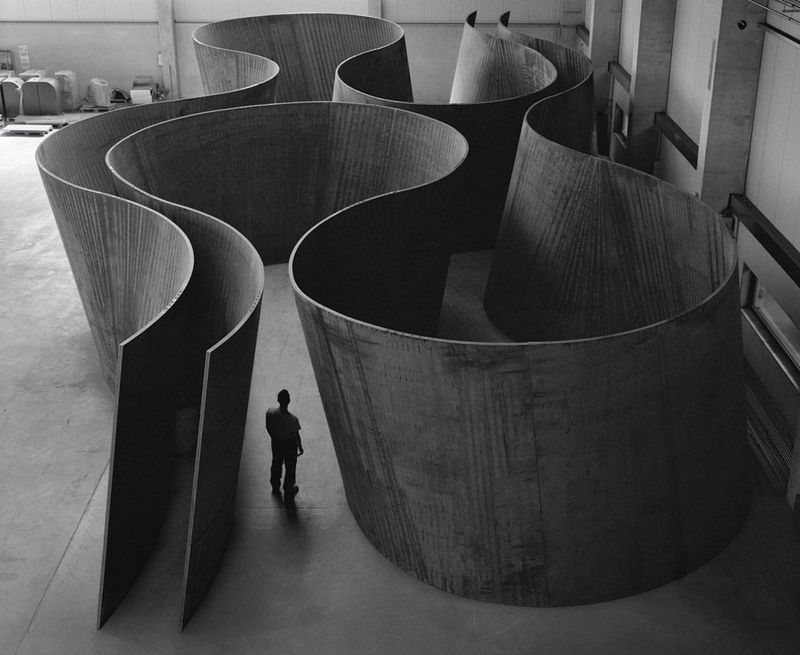 The outer- facing surface of the torus was the loveliest, as it was one of Serra’s ‘tightest’ (highest curvature) shapes, set against he brilliantly white volume of Gagosian’s chambers. 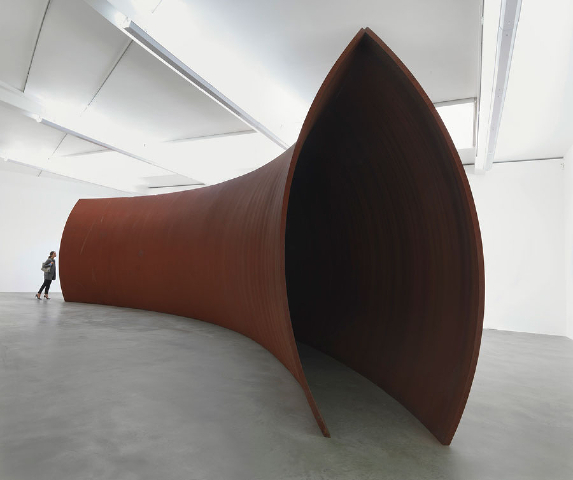 To me it most recalled the nose of a tanker hull, and of course, Serra’s chosen instrument for fabricating such works are the massive rollers and benders of a naval steel mill in Maryland. Kiefer’s retrospective at the RA, on the other hand, gave a sense of abashed politeness. Largely omitted were his most befuddling, or plain hideous, works: the gown-sculptures, Zweistromland , or Jericho. The reasons could be various, including the fact that Jericho, for instance, had been shown in the RA courtyard in 2006, or the difficulty in arranging loans. But I suspect there was a very British element of maintaining ‘good-taste’, leaving the most over-the-top works out, not overshadowing with the elegance of the RA buildings, perhaps even not offending the biddies that are the visiting, if not funding, bread-and-butter of a venerable establishment like the RA. I also say this, having seen his interview with Tim Marlow in April 2014, when he mentioned, in a tone of mildly aggrieved complaint, the critical perception that he only makes big, bombastic paintings, and that, in fact, he makes a lot of modest-sized non-paintings, such as books. 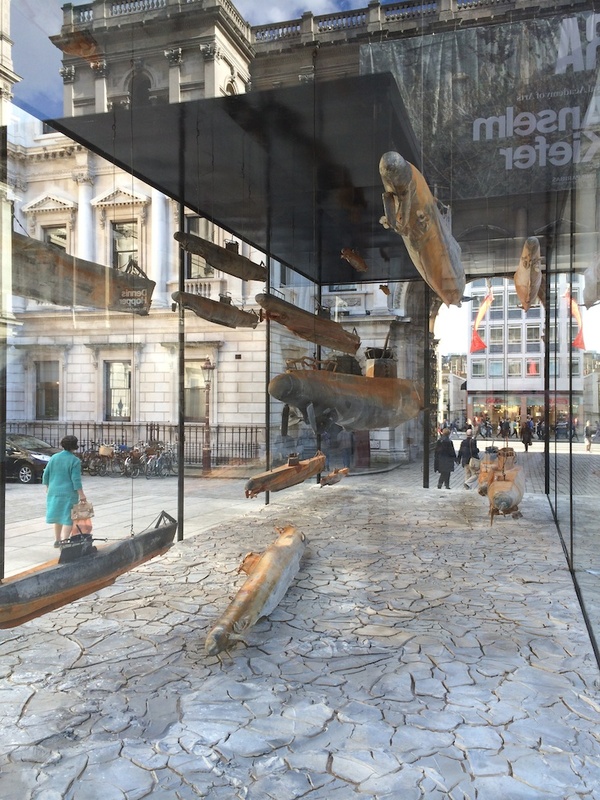 Kiefer installation outside RA, 2014. There were a lot of books, many of them recent, and filled with watercolours. I found them broadly bloodless. His diamond-studded paintings, while open to criticism of being a bit bling, continue his long concern with alchemy, as well as fluency in a range of natural materials: straw, lead, copper, gold, earth, informed by the ideas of the British philosopher Robert Fludd (d. 1637). In fact, I’m rather surprised he didn’t use diamonds before. 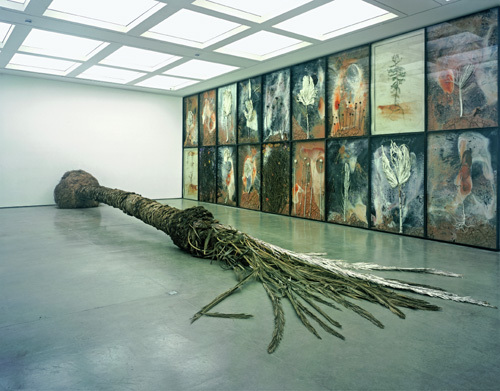 He continued another theme by building an installation or quasi-labyrinth of wood-blocked panels, that (perhaps) tried to, unsuccessfully in my opinion, re-introduce the physical awe that the viewer might have once felt in front of a massive Kiefer. Yet I just saw exposed stretcher frames, wood-block on canvas, and the vague suggestion of an English garden maze. In fact, the whole exhibition somehow looked worse, and cramped, in the fustily ornate halls of the RA, than one imagines it would look in the vast white spaces of White Cube Bermondsey or Thaddeus Ropac Paris. Kiefer installation (‘Jericho’) outside RA, 2006. Lastly, there was a 3-4 metre high stack of canvases, lead-covered sunflowers, and general detritus. On one hand, the reference, presumably the number of failed paintings that lead to one successful one, was somewhat trite or obvious. More positively, I interpreted the sculpture as an evolution of Kiefer’s obsession with himself as an artist (visible in the palettes embedded in many of the earlier works). I could also see a, probably unintended, conceptual comment on the fashion in some contemporary painting to slightly obsessively highlight the materials, stretchers and canvas. Kiefer at White Cube Hong Kong exhibition. Kiefer from White Cube website, 2006. Overall, as a retrospective it works well, but I’d say, and this goes somewhat for the Serra show, that I’d love to see something surprising and fresh, a la late Titian or Matisse, come out of either, or both, artists in the years ahead.